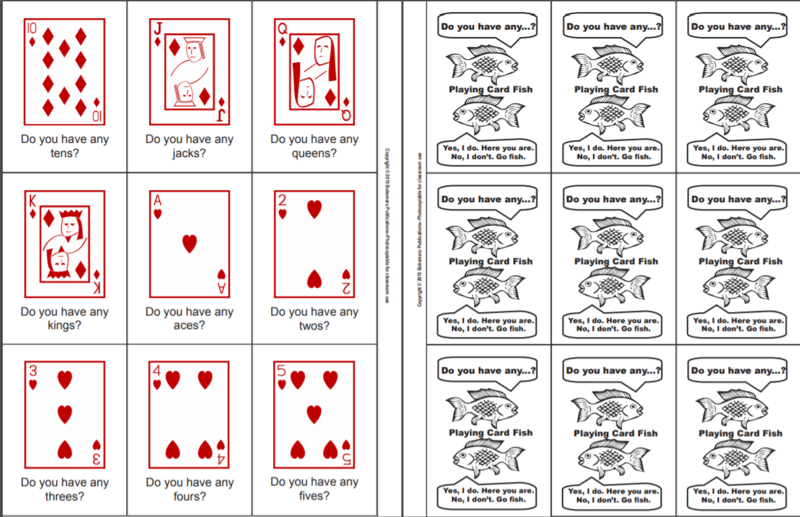 Practice yes-no questions with this great card game. Play this card game in groups of three or four. Shuffle and deal six cards each. Players take turns asking “Do you have any _____?” to complete books of the same rank. The player with the most books at the end of the game is the winner. For complete playing instructions, see How to Play a Card Game below. This serious game promotes accurate pronunciation of plurals, questions with do-fronting, short-answer negation with don’t, and positive affect. 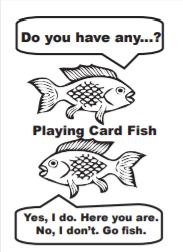 Reading the rules of Go Fish is a great reading comprehension activity because it leads to action, not just knowledge. Anyway, learning the game will provide you with an enjoyable social activity for future encounters with English speaking peers outside of the classroom. 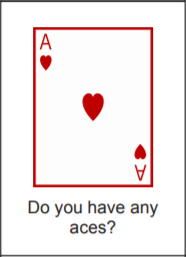 The card back remind students of the question form: Do you have any…? They also list the target structures for affirmative and negative short answers: Yes, I do. Here you are. No, I don’t. Go fish! For example, if I am sitting to the left of the dealer, I go first. Imagine that among the cards in my hand, I am holding at least one six, I can turn to another player and say: “Mark, Do you have any sixes?” It is essential that I ask the question using the player’s name. Otherwise, there might be some confusion. If, let’s say, Mark has a six, he must give it to me. If he has two sixes, he must give them both to me. If he has three sixes, he must give all three sixes to me. With my original six, I would then have four sixes. I have made a book of sixes. I must display books face-up in front of me. But let’s say that Mark has only one six. He will give it to me. My turn continues. I can ask another player for the same or another card in my hand. Equally, I can ask Mark for another card in my hand. My turn ends when I ask someone for a card they do not have. To which he or she will respond, “No, I don’t. Go fish.” I finish my turn by taking a card from the pond, the pile in the center of the circle of players. If, however, I pull out the card I was asking for, I have “fished my wish” and my turn continues. (To be fair, I should show everyone the fished wish, otherwise they might doubt that I am telling the truth.) If it is another card—different from the card I asked for, my turn is over and the player to the left gets a turn. For example, let’s say I ask Mark for sixes, he gives me two. I turn to Christine and ask her if she has any sixes but she replies “No, I don’t. Go fish.” I then pull a card from the pond. It is a jack. I have not fished my wish. It is now Mark’s turn because he is sitting to my left. Christine will go after Mark because she is sitting to his left. The goal of the game is to collect and display the most books. The game continues until all of the cards in the middle have been fished and every player has exhausted all of his or her cards by giving them away or forming books. Sometimes a player will be asked for cards and find himself giving away his last card. There are two ways to handle this situation. The easy rule is to let the player immediately fish for a card in the pile. This keeps him in the game. The hard rule requires the player to wait for his turn to fish for a card. It is called the hard rule because that player’s turn comes to end by fishing. Players should conduct a majority vote to decide which rule to use for the duration of the game. Print cards using a colour or black and white printer. Do not fit the cards to the pages or you will have more cutting to do. Print two-sided copies. Print one copy for every group of three-four students.